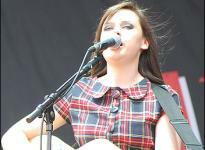 Step aside Alexandra, Imogen Heap, Fall Out Boy and, at risk of controversy, even Jeff Buckley because it was Amy Macdonald's version of 'Hallelujah' that had the real X-Factor as she performed at a sold out Newcastle Carling Academy. Joined on stage by a band of two electric guitars, drums and keyboard the little Scot with the big voice performed songs from her debut album This Is The Life. A rather lacklustre start caused by picking some of her lesser known and slower tracks combined with a worrying moment where her relatively unimpressive cover version of 'Mr Brightside' had more of her fans singing along to it than any of her own songs didn't signal a great night ahead. But enter her most successful UK single 'Mr Rock 'n Roll' and the whole atmosphere transformed. An increase in the audience's energy levels swept across the Academy and the gig really got going. Self-titled album track and massive European hit 'This Is The Life' alongside other singles 'Poison Prince' and 'Run' along with talentless celebrity mocking 'Footballer's Wife' were all well received. Heart strings were then nearly ripped out than merely just tugged with the Glaswegian's version of 'Hallelujah' reducing the audience to an almost stunned silence. If there was ever a charity for badly beaten guitars then most of Amy's would probably be receiving support from it, as three guitars got caught in a constant circular process of being played, returned and re-tuned, with her strong strumming doing them no favours. Midway-through the hour and a half set it was difficult to determine if Amy was singing with passion or pain. This was highlighted by a couple of incidents where her voice had lost strength and couldn't be heard, but then if you'd performed around 100 times this year, your vocal chords might just be a little tired too. Self-deprecating at times, Amy admitted that 'A Wish For Something More' had started to sound "crap" so a re-worked and much improved version of it shortly followed. Finishing the night in a suitably festive mood with Amy, her band and the audience sang along to 'Fairy Tale Of New York', rounding off an impressive and enjoyable performance with some intimate acoustic moments. It's to be hoped she'll soon take a break from touring - but only in order to release that increasingly overdue second album.